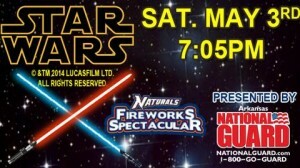 Description: It’s Star Wars Night on Saturday, May 3rd! It’s Star Wars Night featuring a post-game Fireworks Spectacular at Arvest Ballpark on Saturday, May 3rd presented by the Arkansas Army National Guard. Star Wars characters such as Darth Vader, R2-D2, Stormtroopers and more will be on hand to meet fans. Gates open at 6pm for a 7:05pm first pitch against the Arkansas Travelers!